Flowering shrubs play important roles in the landscape. They can be used as privacy hedges, borders, foundation plantings or specimen plants. With the long growing season of zone 9 landscapes, long blooming flowers are very important. When windows can be open in the middle of winter, fragrant landscaping plants are also a benefit. Continue reading for information on flowering shrubs for zone 9. Some shrubs are considered reliable, long bloomers in cold climates and warm climates alike. Certain varieties of these shrubs just may show better cold hardiness or heat tolerance than others. When purchasing zone 9 flowering shrubs, read tags and ask nursery or garden center workers plenty of questions to be certain the shrub is the right fit for your landscape. For example, if you live in a coastal area, be sure to ask how the plant tolerates salt spray. If you hope to attract birds and pollinators, ask about this. If wildlife has a nasty habit of eating everything in your landscape, inquire about deer resistant plants. In zone 9 it is especially important to ask about a shrub’s heat tolerance and whether it will require a sheltered location. Rose of Sharon – Hardy in zones 5-10. Prefers full sun- part shade. Blooms from early summer to fall. Knock Out Rose – Hardy in zones 5-10. Prefers full sun- part shade. Blooms spring to fall. Excellent heat tolerance. Hydrangea – Hardy in zones 4-9. Prefers full sun to shade depending on variety. Blooms all summer. 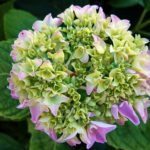 Even sun-loving hydrangeas may need protection from the intense heat and sun of zone 9. Daphne – Hardy in zones 4-10. Full sun- part shade. Blooms spring to summer. Butterfly Bush – Hardy in zones 5-9. Prefers full sun. Blooms summer to fall. Glossy Abelia – Hardy in zones 6-9. Fragrant blooms in summer through fall. Evergreen to semi-evergreen. Attracts birds but deters deer. Full sun to part shade. 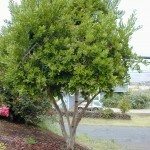 Dwarf English Laurel – Hardy in zones 6-9. Fragrant spring-summer flower spikes. Bird attracting black fruit summer-fall. Part shade. Rosemary – Hardy in zones 8-11. Midsummer blooms. The entire shrub is fragrant. Height depends on variety, some may be low growing and sprawling, while others are tall and upright. Deer resistant. Attracts pollinators. Evergreen. Full Sun. Camellia – Hardy in zones 6-11. Fragrant blooms from fall to spring. Evergreen. 3-20’ tall and wide depending on variety. Part shade. Fringe Flower – Hardy in zones 7-10. Full sun to part shade. Attracts pollinators and birds. Dwarf Bottlebrush – Hardy in zones 8-11. Full Sun. Evergreen. Spring through summer blooms. Deer resistant. Attracts birds and pollinators. Azalea – Hardy in zones 6-10. Full sun to part shade. Late winter to early spring blooms. Evergreen. Attracts pollinators. Indian Hawthorn – Hardy in zones 7-10. Full sun to part shade. Evergreen. Spring and summer blooms. Carolina Allspice – Hardy in zones 4-9. Sun to shade. Fragrant spring through summer blooms.